Formulation is the process in which a variety of different substances are combined in precise proportions to create a specific product. The proportions of the various substances mixed together in the formulation recipe are determined in the formulation development process. The formulation development process involves repeated experimentation with the ingredient substances to achieve the desired characteristics in the final product: e.g. taste, color, shelf-life, performance, or effectiveness. Formulation development is highly dependent upon weighing the ingredients accurately. If one step in the weighing process is wrong, the scientist is required to go through the tedious recalculation and adjustment of the other ingredients to make the correction. If this mistake goes unnoticed, products may have different properties or be out-of-specification, resulting in waste, costly reworking or may even pose a risk to the health of the end consumer, particularly in the pharmaceutical and food industries. In a formulation, ingredients are typically added one by one to the selected container. The capacity of the balance must be large enough to accommodate the sum of all ingredients plus the container. Depending on the accuracy and capacity required, the use of two different balances may be necessary. Combination of active pharmaceutical ingredient (API) with various inert ingredients (excipients) which allow to bring the drug into a form it can be administered to the patient. Possible forms may be tablet, capsule, inhaler or intravenously. Drug effectiveness – only a drug which releases its API at the right place is effective. 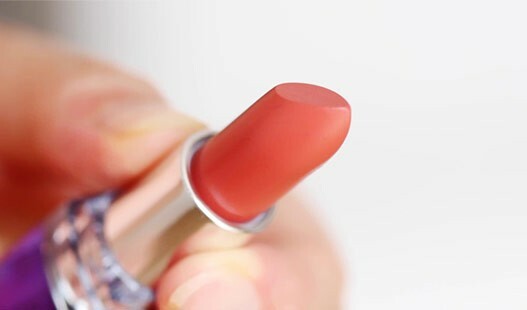 Cosmetics / Flavor & Fragrance Flavors or cosmetics are delicate combinations of 50 or more substances which need to be combined in an accurate manner. Differences in its formulation might result in difference in flavor. Chemicals / Petrochemicals Large variety of products such as i.e. oils, paints, glues and lacquers. Such products often contain highly volatile or toxic substances. Food & Beverages Development of new products due to market demands. Development of new flavors, product with different texture at optimized costing. Formulation development requires accurate execution of the formulation recipe to ensure safe, high-quality products. Selection of the right balance to meet the formulation accuracy requirements is vital, as is ensuring that weighing always takes place in the safe weighing range of the balance. To determine the safe weighing range, the balance's minimum weight must be determined. If you need support or advice on whether your balance meets the needs of your formulation applications, please don't hesitate to contact us. Typical sources of error in any weighing process include: Lack of weighing tolerances, use of inappropriate instrumentation, sample spills, temperature variations, air drafts, documentation errors and insufficient scientist skills. As formulation processes involve multiple weighing steps, the combined errors can become significant. Every formulation is developed to meet certain criteria, whether it be taste, color, or drug dosage. Without consistency in the formulation, the product will fail to meet expectations, leading to dissatisfied customers, and may even pose a risk to health and/or safety. It is therefore essential to ensure that the weight of each formulation ingredient meets the process tolerances defined in the formulation SOP. The balance used must be able to fulfil the desired process accuracy requirements and should have appropriate quality assurance measures in place to ensure this. For small quantities of critical or expensive ingredients, it may be necessary to use a second balance with a higher readability and greater accuracy, particularly where there is a large difference between the individual ingredient amounts and the total target mass. Having two balances occupies more lab space, creates extra steps in the workflow, increases the process uncertainties and necessitates a higher investment. To ensure traceability, formulation documentation typically includes formulation ID, substance ID, target mass, tolerances, and actual amount dosed, as well as basic information such as date, time, and user ID. Any recalculations and adjustments must also be documented. Manual recording of all this information carries a huge risk of human error. If there is any mistake in the formulation, it may be impossible to find the source of the error if the data has been recorded incorrectly. 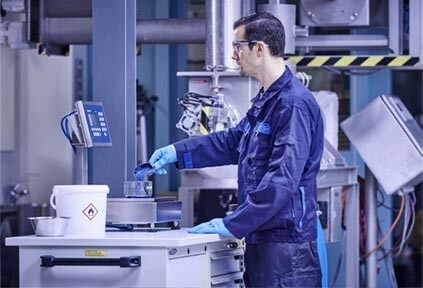 METTLER TOLEDO offers a range of laboratory solutions for formulation to meet the varying needs of different industries. For basic formulation needs, you can trust our Standard Level analytical and precision balances to deliver accurate and reliable results. 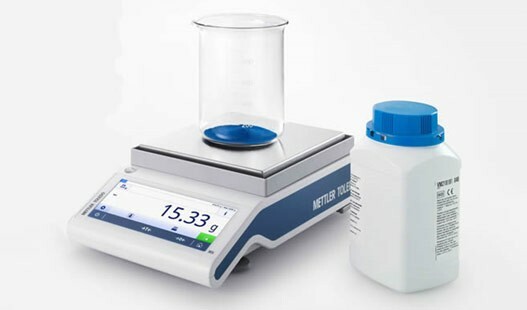 METTLER TOLEDO XPR precision balances provide you with fast and accurate formulations, even under the toughest weighing conditions, both in the lab or out on the factory floor. Smart quality assurance features, such as StatusLight™, LevelControl and GWP Approved help ensure right-first-time results. The built-in formulation application can be tailored to your specific formulations. You can save your customized formulation methods in the method library. The intelligent methods recalculate ingredient amounts automatically depending on the total quantity you want to prepare. The high stability provided by the unique SmartPan™ weighing pan means you get your results up to twice as fast compared to a standard weighing pan. You can connect a barcode scanner to read in substance IDs quickly and without error. Results and task data are automatically recorded on the built-in results protocol, eliminating time-consuming and error-prone manual data input/output. Multiple interfaces (4 USB, 1 LAN) make it easy to export results to a PC or other system. For high accuracy demands, METTLER TOLEDO's higher performance balances are perfect when there is a low net sample weight and a requirement for exceptional repeatability. These higher performance balances enable users to weigh small ingredient quantities with a unique level of precision while still having the capacity to weigh all formulation components on one balance. The need for two separate balances is eliminated. Connect your XPR balance to LabX laboratory software for comprehensive data management and full traceability. The solution can be integrated with your company's existing ERP/LIMS system, enabling bi-directional transfer of recipes and results. LabX takes care of all process information and calculations automatically. All data is saved securely in a centralized database and reports can be generated at any time. Instruments, tasks and users can all be managed centrally. For highly regulated environments, LabX helps with compliance with FDA ALCOA+ data integrity requirements. Watch the video and see how XPR balances can save you time and money when preparing formulations thanks to customizable methods, SOP user guidance, automatic calculations and the built-in results notepad. Are You Weighing in the Safe Weighing Range? Weighing results can only be accurate and reliable if you are weighing within the safe weighing range of your balance. Our free guide explains the science behind safe weighing and describes how you can determine the safe weighing range of your balance in three easy steps. Most importantly, find out why all this is necessary to determine your safe weighing range. 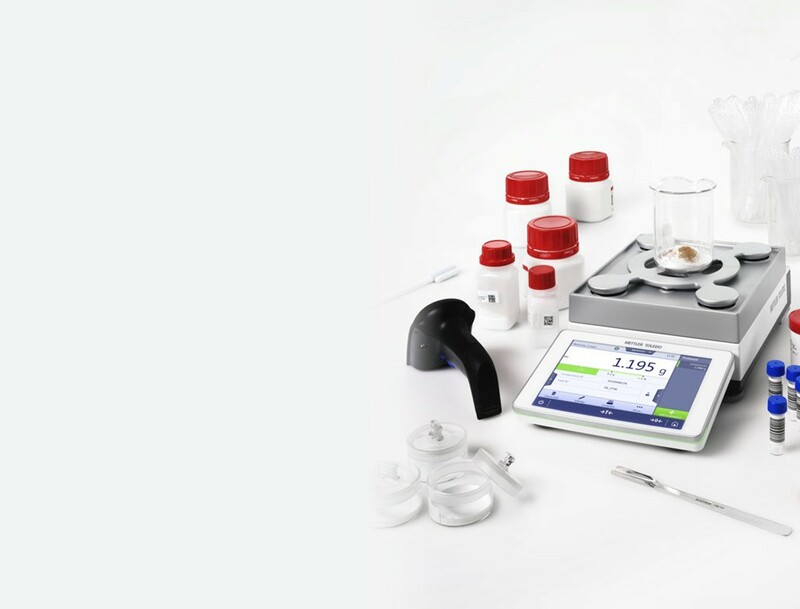 METTLER TOLEDO's Advanced Level analytical and precision balances offer an alternative solution for formulation applications, by addressing the challenges faced during sample handling and final documentation. MS-TS balances feature RS232 and USB interfaces enabling a METTLER TOLEDO P-50 printer and a barcode reader to be connected to the balance. MS-TS balances have a built-in formulation application which provides step-by-step guidance through the whole formulation process. The recipe code and the ingredient IDs can be entered quickly, and without error, by using barcodes. The application automatically records each weight value and zeros the balance in between the addition of each ingredient. At any time, it's possible to view the ingredients added and see their weight values in a table, pie or bar chart. Once the recipe is complete, the whole formulation can be printed out or saved on a USB memory stick to ensure traceability. The printout can be customized to include up to 3 task IDs, 1 sample ID, 1 user ID, and the time and date. The time consuming and error-prone manual recording of sample IDs and weight values is eliminated. Hence, the overall process is much faster and more secure. The combination of a METTLER TOLEDO MS-TS balance with a printer and barcode reader is an efficient and cost-effective solution for creating and tracking formulations. This application guide describes how recipe formulation can be accurately and efficiently undertaken using a simple combination of a handheld barcode reader, a METTLER TOLEDO P-52 printer, and a METTLER TOLEDO MS-TS or ML-T precision balance. Read how you can solve typical formulation challenges and follow the step-by-step screenshots to see how easy formulation can be. In the development of a new product, formulation is used on a small scale to create the perfect formulation recipe. For manufacturing, the formulation is scaled-up to produce the quantities required by consumers. Weighing ingredients in much larger quantities requires industrial balances. Download your free checklist and start improving weighing performance in your lab today! How can I ensure that the weight of each my formulation ingredients stays within the defined weighing tolerances? 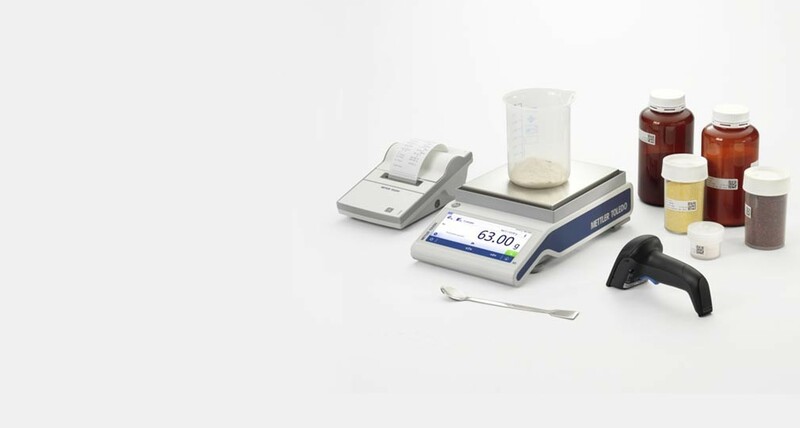 METTLER TOLEDO Excellence Level balances enable you to save the formulation method, with ingredient amounts and its individual tolerances, on the balance. The built-in weighing guide helps you to dose to target and will provide a warning if you exceed the predefined limits. If you combine your Excellence Level balance with the LabX laboratory software, LabX can automatically adjust the ingredient quantities in the event that you exceed the tolerance of an ingredient. During the formulation development process, can I save a formulation method and run it again later? With Excellence Level balances you can save a formulation method on the balance which can be run again at any time. I have to tick my formulation ingredients off a list as I add them and sometimes I get lost off. How can I avoid this? On our Advanced Level balances you can see at any time how many ingredients you have added. The interim results can be viewed at any time directly on the balance display so you can confirm where you are in the formulation process. On our Excellence Level balances, the formulation method is saved on the balance and will prompt you for the next ingredient by name, providing you with a simpler and more secure formulation process. In our formulation development lab, we write down all the weights of the ingredients by hand. This takes a lot of time and I'm sure we sometimes make mistakes. How can we avoid this and speed up the process? On both our Excellence Level and Advanced Level balances, the weight values of the individual formulation ingredients are saved automatically on the balance. The interim results can be viewed at any time. The final results can be printed out or transferred to a PC. Manual transcription of your formulation results is no longer necessary so transcription errors are eliminated, and you have more time to create new formulations. In our food recipe development lab, many of the ingredients have similar colors. How can I be sure I don't add the same one twice? A good idea is to include barcode labels on your ingredients to uniquely identify each sample. Excellence Level and Advanced Level balances support barcode readers; the ingredient barcode is scanned prior to adding it to the formulation so it's easy to check that you have the right ingredient. By connecting your Excellence Level balance to LabX, a warning will be given if you scan the same barcode again so it's not possible to add the same ingredient twice. We make customized formulations of medicines to meet the particular needs of individual patients. We have to be sure to follow the formulation exactly and traceability of the raw materials is crucial. An Excellence Level balance, LabX, a barcode reader and a printer can support you to meet your security and traceability requirements. Using barcodes eliminates the risk of transcription error. On scanning a barcode, LabX will provide prevents from discrepancies from the formulation. LabX can print a detailed, barcoded label for the finished formulation. All the information is stored securely in a centralized database so traceability is assured. 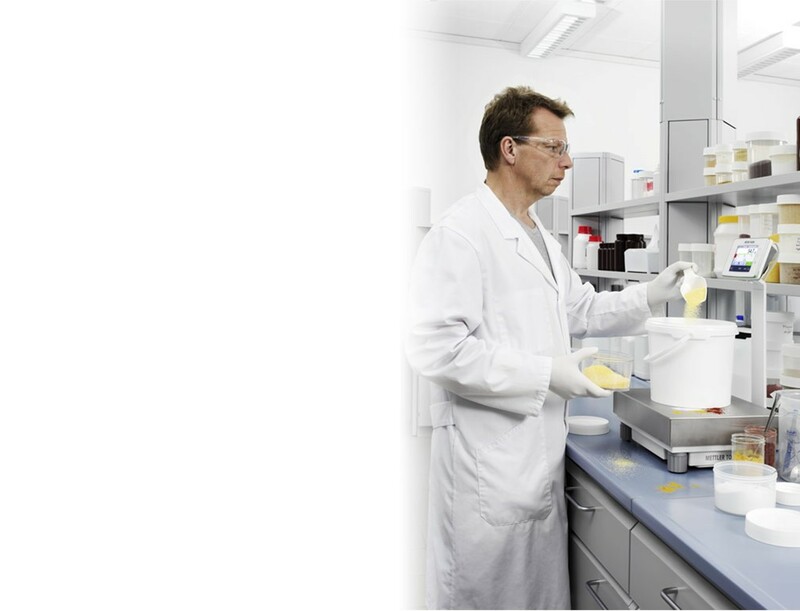 In our R&D lab, when we prepare formulations, we have problems with our balances not settling. We have noticed that sometimes reproducibility of our recipes is poor. What can we do? When a balance fails to settle, there is a high chance that the weighing cell is being influenced by electrostatic charges. Electrostatic charges can build up on containers and samples through normal handling so you aren’t doing anything wrong. Sometimes the balance is able to settle but the weight value displayed on the balance may not be the true amount of the substance added, which could explain why reproducibility is poor. Electrostatic charging is one of the biggest hidden sources of weighing error so it's important to take steps to remove electrostatic charges from your containers and samples. Free-standing ionizers can be placed next to your analytical or precision balance; simply pass containers and samples through the ionizer before placing them on the balance. For a comprehensive static detection and elimination solution, Excellence Level analytical balances feature the innovative StaticDetect™ technology. StaticDetect measures the weighing error due to electrostatic charging and provides a warning if user-defined tolerances are exceeded. The Excellence Level optional ionizing module can be set to work automatically when the draft shield doors are closed, eliminating electrostatic charges inside the weighing chamber in just a few seconds. We have a database of formulation components in our LIMS. How can I transfer the information I need to the balance? 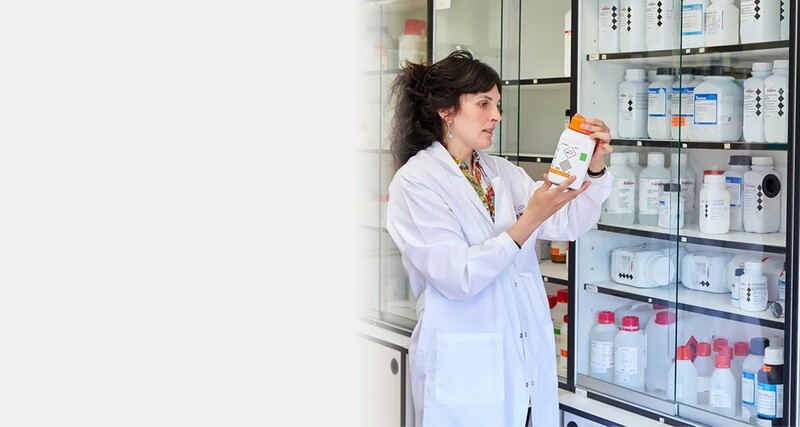 LabX laboratory software is easily integrated with your LIMS to facilitate the transfer the information related to your formulation components to the formulation method run on the balance.